Round 8 of the 2014 National Enduro series took place in the spectacular views and crisp mountain air of Colorado. The KR4 Performance crew had their work cut out for them, with over 1,700 miles to drive between the KR4 headquarters and the race site. The race course, carved out of the existing trails in the spectacular Uncompahgre National Forrest, was strikingly different than the normal conditions found on the East Coast. Dry soil fostered a LOT of dust that hid many trail hazards, but the course was enjoyed by visitors and local racers alike. The most exciting news for KR4 that weekend was Ian Blythe’s return to action. After being forced to miss the first half of the year with a shoulder injury, Ian was excited to come out swinging at the Snowshoe. As a Colorado native, Ian also felt he had something to prove at his “hometown” race. Riding near the back of the pro lineup on Row 41, Ian had a lot of dust and slower traffic to contend with. Ian showed he had lost no speed during his absence, as he won two tests and was in 3rd O/A going into Test 6. Unfortunately, a slight bobble in the final test dropped him to 5th O/A for the day, but we are still very proud of Ian for earning a great finish! Jubal Brown made the trip out to Colorado as well. “I guess you could consider this my hometown race. It is the closest one to my house – it was only an 11 hour drive!” Jubal was at home in the dusty conditions, as the soil composition and trail terrain is very similar to Idaho. Jubal had good speed all day, but numerous little problems hampered his test times. Things were going great in Test 3 until a hidden log broke off his rear brake pedal, but Jubal repaired it and rebounded in Test 4 to set the fastest A Overall time and earn an impressive 23rd overall in that test. Jubal finished the day 6th in Open A.
Colin Keegan made the long trek to Colorado to see what these “mountains” were all about, and he brought younger brother Conner along as well. Both boys had never seen Sage Brush before and commented on how good it smelled. The local riders offered to let them take home as much as they wanted! Riding on Row 18, both brothers did a great job of navigating the dust and tricky trail obstacles. Colin finished a strong 2nd in 250B, while Conner scored the Overall C win in his first ever National Enduro aboard his KTM 150. 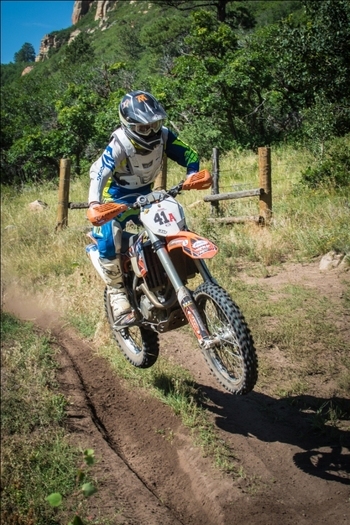 KR4’s star Womens A/B contestant Brooke Cosner is getting to be a seasoned Enduro veteran. After her third NEPG appearance in a row, Brooke is now comfortable with the format and is starting to learn the tricks of the trade. Despite being uncomfortable in the dust, Brooke set the second-fastest times in tests 1 & 2! She rode great all day and finished 4th in her division. Brad Myers traded in his 300 2-stroke for a shiny new 350 thumper to contest the Snowshoe Enduro. Brad commented that his 350 was running like a 250F, but with the race being held at 8000 feet, everyone’s bike was starving for air and was down on power. The 50+ A division was extra popular in Colorado with 30 entrants, but Brad held tough and finished a respectable 13th place. The long haul from the East Coast all the way to Colorado generated a lot of interest in our Arrive-n-Ride program at the Snowshoe. New York’s Steven Michalski and Georgia’s Ricky Holsomback left their personal bikes at home in the garage and called KR4 to arrange an all-inclusive racing weekend in the Rockies. Steven and Ricky both leased a pair of our expertly-prepped KTM race bikes, so when the riders arrived at the staging area, their borrowed bikes were there already, prepped for battle. All that was left for them to do was to enjoy the ride, and both riders logged great finishes. Steven dominated the 55+ A division, winning every special test but one. Ricky had a good day as well and carded a 5th place finish in 55+B, one of his best finishes of the year. Scott McCullough and Chris Bottomy once again took advantage of KR4’s bike hauling service, as the extra-long travel distance from back East made using KR4’s services a no-brainer. The KR4 mechanic staff did some extra TLC to Scott and Chris’s bikes, so they were pre-jetted and in race trim when the duo unloaded them out of the KR4 trailer. Riding together on Row 50, Chris finished in 7th in 200A after getting turned around in the dust, while Scott delivered a season-best 2nd place finish in the 250C division and is in 2nd position in the series championship so far. Way to go Scott! Newcomer Tom Nagle also used our Bike Hauling service to get his own personal bike out to the Colorado Rockies clear out from Atlanta, Georgia! Tom flew in and left the rest up to us! We got his bike there no problem, and he delivered an excellent performance with a 4th place finish in the 55+ B class. After the race, the KR4 crew filled the race trailer back to the brim with bikes and gear, and Team Manager Fred Andrews got behind the wheel to make the long trek home. Check back in with us as our riders attack NEPG Round 9 in Union, South Carolina on August 31st. We hope to see you there!